In Little Fish, the author imagines life for Mennonite trans people across generations. 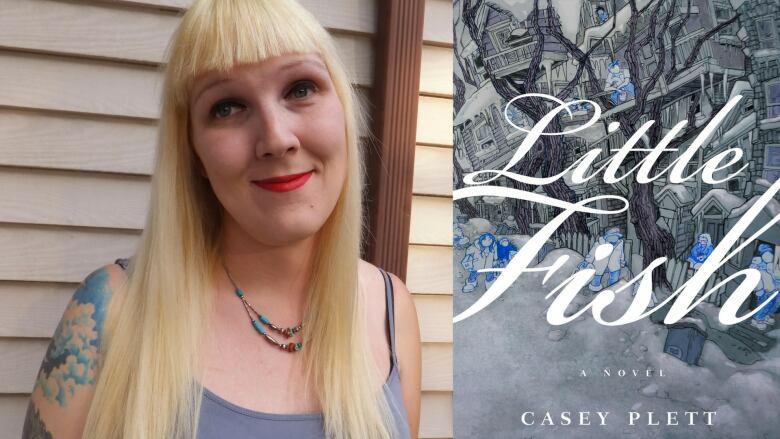 Casey Plett's debut novel, Little Fish, follows Wendy, a trans woman living in Winnipeg whose life is turned upside down when she is told a family secret: that her Mennonite grandfather was possibly also transgender. Wendy decides she needs to know the truth, and begins a quest to confront her family and the Mennonite culture she was raised in. "The character of Wendy came out and transitioned in her 30s. Her dad, who had always been financially and emotionally unstable, was supportive; but he was having a breakdown at the time and could only be there for her so much. The rest of her family was fairly conservative, so she had to go through her transition alone. Her parents gave her a religious upbringing. It was around high school she didn't want to go to church anymore. She later realizes maybe that's more a part of her than she's given herself credit for. By the time we reach her in Little Fish, she's more stable than she had been. But as the book goes on, some of that starts to destabilize again. I want to explore a realistic narrative about transgender life and how I also see trans women around me surviving." "Wendy is a person who hasn't been able to have role models. I think a very common experience for trans women is not having people around who have had your experience. Over the past decades, many trans women went stealth — which means you don't talk about or admit it to anybody, including other trans people. All that means is that Wendy has nobody to look to. When the possibility comes up that her grandfather might have been trans, she becomes obsessed with figuring this out. If she can find out how he navigated his troubles, maybe that would tell her something about herself." "I do not think my grandfather or great-grandfather were secretly transsexuals. But queer Mennonites have existed for as long as there have been Mennonites. It's probably been an internal, quiet and unwritten experience. Part of me writing Little Fish came out of thinking that if past generations who died when I was a kid or earlier were transgender, I probably would have never known. Throughout Little Fish, Wendy passes as cisgender. So how you look to a person can mean all sorts of things that you have no idea about and, in some ways, can't really control. We all have things we don't understand about ourselves." Casey Plett's comments have been edited and condensed.